GDP (2004): $369.6 billion (456.5 billion Swiss francs). Annual growth rate (2005): 2.8% in real terms. 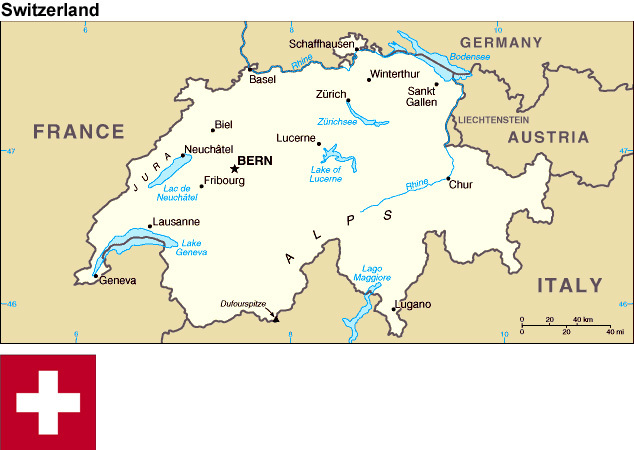 Per capita income (2001): $30,522 (37,695 Swiss francs). Agriculture (est. 1.8% of GDP in 2004): Products--dairy, livestock, grains, fruit and vegetables, potatoes, wine. Industry (est. 28.2% of GDP in 2004): Types--machinery, chemicals, pharmaceuticals, time pieces, precision instruments, textiles and clothing, pigment, transportation equipment. Services (70% of GDP in 2005). Trade (2002): Exports--$148.6. billion (183.5 billion Swiss francs): machinery and electronics; chemicals and pharmaceuticals; instruments and timepieces. Major markets--Germany, United States, France, Italy, U.K., Japan. Imports--$135 billion (166.7 billion Swiss francs): machinery and electronics; chemicals; vehicles. Major suppliers--Germany, Italy, France, Netherlands, U.S., U.K., Japan. Almost all Swiss are literate. Switzerland's 13 university institutes enrolled 111,100 students in the academic year of 2004-05. About 25% of the adult population holds a diploma of higher learning. The administration of justice is primarily a cantonal function. The Federal Tribunal is limited in its jurisdiction. Its principal function is to hear appeals of civil and criminal cases. It also hears complaints of violations of the constitutional rights of citizens and has authority to review cantonal court decisions involving federal law as well as certain administrative rulings of federal departments. However, it has no power to review federal legislation for constitutionality. The Tribunal's 30 full-time and 30 part-time judges are elected by the Federal Assembly for 6-year terms. The Federal Criminal Court is the court of first instance for criminal cases involving organized and white-collar crime, money laundering, and corruption, which are under federal jurisdiction. The Court�s 11 judges are elected by the Federal Assembly for 6-year terms. On December 10, 2003, Christoph Blocher--a self-made industrialist and main figure of the right-populist Swiss People's Party known for his strong opinions on asylum and migration and law and order issues--was elected to the cabinet by parliament, replacing the incumbent Christian Democrat Justice and Police Minister Ruth Metzler. The parliament also elected the Free Democrat Hans-Rudolf Merz to replace retiring Finance Minister Kaspar Villiger. Both Blocher and Merz are strong advocates of drastic public spending cuts in order to reduce the country's mounting $102 billion francs state deficit and are staunch opponents to Switzerland's entering the European Union. On June 14, 2006, the Federal Council elected Doris Leuthard of the Christian Democratic Party. Leuthard replaced the retiring Joseph Deiss and has assumed the Economics and Trade portfolio that Deiss managed. Leuthard�s election and Deiss� resignation do not change the dynamics of the Federal Council. The current makeup of the government remains fiscally conservative and against further integration with the European Union. Despite a dearth of natural resources, the Swiss economy is among the world's most advanced and prosperous. Per capita income is virtually the highest in the world, as are wages. Trade has been the key to prosperity in Switzerland. The country is dependent upon export markets to generate income while dependent upon imports for raw materials and to expand the range of goods and services available in the country. Switzerland has liberal investment and trade policies, notwithstanding agriculture, and a conservative fiscal policy. The Swiss legal system is highly developed, commercial law is well defined, and solid laws and policies protect investments. The Swiss franc is one of the world's soundest currencies, and the country is known for its high standard of banking and financial services. Switzerland is a member of a number of international economic organizations, including the World Trade Organization, the International Monetary Fund, the World Bank, and the Organization for Economic Cooperation and Development (OECD). Being a nation that depends upon exports for economic growth, and due to the fact that it is so closely linked to the economies of Western Europe and the United States, Switzerland has not been able to escape recent slowdowns experienced in these countries. During most of the 1990s, the Swiss economy was Western Europe's weakest, with annual GDP growth averaging 0% between 1991 and 1997. Beginning in late 1997, the economy steadily gained momentum until peaking in 2000 with 3% growth in real terms. The economy returned to lackluster growth during 2001-2003, but has been growing at or above potential since 2004--2.5% per annum. The Swiss Economic Ministry reports that strong global demand, particularly in the U.S. and Asia, and better Euro zone growth has helped Switzerland�s economic recovery. Long-run economic growth, however, is predicated on structural reforms. In order to maximize its economic potential, Switzerland will need to push through difficult agrarian and competition policy reforms. These are essential if the government is to reduce its budget deficits and meet its 3% growth target. In 2005, the dollar/Swiss franc exchange rate continued to be shaped by geopolitical tensions. The dollar depreciated further against the Swiss franc from SF 1.49 in October 2002 to SF 1.31 in 2003, to 1.28 in 2005, and to 1.23 in July 2006. The strengthening of the Euro, however, helped Switzerland to minimize the pressure from a weakening dollar. The Swiss National Bank raised interest rates on June 15, 2006 to 1.5%, the third increase since January 2006. The Swiss National Bank also said it expected economic growth to be a robust 2.5% in 2006 and 2007. The number of bankruptcies in Switzerland during 2005 reached new heights--10,800, up 3% from 2004. Bankruptcies have been on the rise for the past four years, but associated financial losses actually fell 5.2%. Five cantons recorded an increase in bankruptcies, with Bern, Thurgau, and Vaud being hardest hit. The Federal Statistics Office�s analysis suggests that the increase in bankruptcies is due in part to restructuring and believes the numbers will continue to increase. The recent economic upswing has had a small impact on the labor market. Unemployment decreased from 4.1% in December 2003 to 3.6% in July 2006. Swiss in the 15-25 age bracket continue to fight unemployment numbers with a rate of 5.4%, and hotel and restaurant industry workers with 10.4%. One-fourth of the country's full-time workers are unionized. In general, labor/management relations are good, mostly characterized by a willingness on both sides to settle disputes by negotiations rather than by labor action. About 600 collective bargaining agreements exist today in Switzerland and are regularly renewed without major problems. However, the mood is changing. The massive layoffs that resulted from both the global economic slowdown and major management scandals have strained the traditional Swiss "labor peace." Swiss trade unions encouraged strikes against several companies, including the national airline SWISS, Coca-Cola, and Orange (the French telecom operator), but total days lost to strikes remain among the lowest in the OECD. Uncertainties concerning under-funded pension funds, and the prospect of a potential hike in the retirement age have stirred further street protests. Switzerland's machinery, metals, electronics, and chemicals sectors are world-renowned for precision and quality. Together they account for well over half of Swiss export revenues. In agriculture, Switzerland is about 60% self-sufficient. Only 7.5% of the remaining imports originated from the U.S. Swiss farmers are one of the most highly protected and subsidized producer group in the world. OECD estimates show that Switzerland is subsidizing more than 70% of its agriculture, compared to 35% in the EU. According to the draft "2011 Agricultural Program", Switzerland intends to reduce its subsidies by SF 638 million to SF 13.4 billion (U.S. $10.5 billion) beginning in 2008. The Swiss economy earns roughly half of its corporate earnings from the export industry, and 62% of Swiss exports are destined for the EU market. The EU is Switzerland's largest trading partner, and economic and trade barriers between them are minimal. In the wake of the Swiss voters' rejection of the European Economic Area Agreement in 1992, the Swiss Government set its sights on negotiating bilateral sectoral agreements with the EU. After more than 4 years of negotiations, an agreement covering seven sectors (research, public procurement, technical barriers to trade, agriculture, civil aviation, land transport, and the free movement of persons) was achieved at the end of 1998. Parliament officially endorsed the so-called "Bilaterals I" in 1999, and the Swiss people approved them in a referendum in May 2000. The agreements, which had to be ratified by the European Parliament as well as legislatures in all 15 EU member states, entered into force on June 1, 2002. Switzerland has so far attempted to mitigate possible adverse effects of nonmembership by conforming many of its regulations, standards, and practices to EU directives and norms. Full access to the Swiss market for the original 15 EU member states entered into force in June 2004, ending as a result the �national preference�. The Swiss agreed to extend these preferences to the 10 new EU members on September 25, 2005. The Swiss Government embarked in July 2001 on a second round of bilateral negotiations with the EU known as �Bilaterals II�. Talks focused on customs fraud, environment, statistics, trade in processed agricultural goods, media, the taxation of savings, and police/judicial cooperation (dubbed the Schengen-Dublin accords). Amid a fierce political debate over the essence of Swiss-EU relations and populist warnings against EU workers and criminals entering Switzerland, the Schengen-Dublin package was approved on June 5, 2005 by a referendum of 54.6%. Fears of cheap labor coming from new EU member states have prompted the government to provide for tripartite surveillance committees to ensure that decent wages are enforced. As part of the bilateral agreement on the taxation of savings signed in June 2003, Swiss banks will levy a withholding tax on EU citizens' savings income. The tax, which started on July 1, 2005, will increase gradually to 35% by 2011, with 75% of the funds being transferred to the EU. The Swiss federal government remains deeply divided over EU membership as its long-term goal, and in a March 2001 referendum more than 70% of the voters rejected rapid steps toward EU membership. The issue of EU membership is, therefore, likely to be shelved for several years, if not a decade. In May 2005, the government said it could sign a framework agreement with the European Union, as an alternative to joining the organization, to encourage dialogue and create a platform for closer cooperation. But in parallel, the cabinet reaffirmed its wish to strengthen ties with other non-EU trading partners in Asia and America. Exploratory talks on a Free Trade Agreement between the U.S. and Switzerland failed to result in negotiations, due to Swiss problems with free trade in agriculture, but the two sides did agree to a new framework for economic, trade, and investment discussions. This new agreement is the Swiss-U.S. Trade and Investment Cooperation Forum (the �Forum�) and is currently assessing areas where the two governments could facilitate greater trade and investment flows. Switzerland ranks 17th among the main trading partners of the U.S. worldwide. The United States is the second-largest importer (11.5%) of Swiss goods after Germany (20%). The U.S. exports more to Switzerland each year than to all the countries of the former Soviet Union and Eastern Europe combined, and Switzerland imports more U.S. products and services than does Spain. In addition, the United States is the largest foreign investor in Switzerland, and conversely, the primary destination of Swiss foreign investment. It is estimated that 200,000 American jobs depend on Swiss foreign investments. Total U.S.-Swiss bilateral trade increased from $15.33 billion during 2003 to $16 billion in 2004. The armed forces are organized in four army corps and an air force and are equipped with modern, sophisticated, and well-maintained gear. In 1993, the Swiss Government procured 34 FA-18s from the United States. On September 10, 2002, Switzerland became a full member of the United Nations. Switzerland had previously been involved as party to the Statute of the International Court of Justice and member of most UN specialized agencies, as well as the International Atomic Energy Agency. Switzerland has long participated in many UN activities, including the Economic Commission for Europe, UN Environment Program, the UN High Commissioner for Refugees, UN Educational, Scientific and Cultural Organization, UN Conference for Trade and Development, UN Industrial Development Organization, and the Universal Postal Union (UPU). Prior to its formal accession, Switzerland had maintained a permanent observer mission at UN Headquarters since 1948. Switzerland also is a member of the following international organizations: World Trade Organization, Organization for Economic Cooperation and Development, European Free Trade Association, Bank for International Settlements, Council of Europe, and Organization for Security and Cooperation in Europe (OSCE). In 1992, Swiss voters approved membership in the Bretton Woods organizations but later that year rejected the European Economic Area agreement, which the government viewed as a first step toward EU membership. The Swiss feel a moral obligation to undertake social, economic, and humanitarian activities that contribute to world peace and prosperity. This is manifested by Swiss bilateral and multilateral diplomatic activity, assistance to developing countries, and support for the extension of international law, particularly humanitarian law. Switzerland (mainly Geneva) is home to many international governmental and nongovernmental organizations, including the International Committee of the Red Cross (whose flag is essentially the Swiss flag with colors reversed--the Red Cross historically being a Swiss organization). One of the first international organizations, the Universal Postal Union, is located in Bern. The Swiss Government on June 25, 2003, eased most of the sanctions against the Republic of Iraq in accord with UN Security Council Resolution (UNSCR) 1483. The government lifted the trade embargo, flight restrictions, and financial sanctions in place since August 1990. The weapons embargo and the asset freeze, the scope of which was extended, remain in force, and restrictions on the trade in Iraqi cultural goods were newly imposed. Though not a member at the time, Switzerland had joined UN sanctions against Iraq after the invasion of Kuwait. Switzerland in recent years joined UN and EU economic sanctions imposed on Sierra Leone, UNITA (Angola), Liberia, Serbia and Montenegro, Burma, Zimbabwe, Sudan, Democratic Republic of the Congo, and Cote d'Ivoire. On October 15, 2003, the Federal Council ended the import restrictions on raw diamonds from Sierra Leone and lifted sanctions against Libya. Switzerland in October 2000 implemented an ordinance to enforce UN sanctions against the Taliban (UNSCR 1267), which it subsequently amended in April 2001 in accord with tighter UN regulations (UNSCR 1333). On May 2, 2002, the Swiss Government eased the sanctions regime in accord with UNSCR 1388 and 1390, lifting the ban on the sale of acetic acid (used in drug production), Afghani Airlines, and Afghani diplomatic representations. The weapons embargo, travel restrictions, and financial sanctions remain in force. The Swiss Government in November 2001 issued an ordinance declaring illegal the terrorist organization al Qaeda as well as possible successor or supporting organizations. More than 200 individuals or companies linked to international terrorism have been blacklisted to have their assets frozen. Thus far, Swiss authorities have blocked about 72 accounts totaling 34 million francs. The first 4 years of cooperation under the U.S.-Swiss Joint Economic Commission (JEC) invigorated bilateral ties by recording achievements in a number of areas, including consultations on anti-money laundering efforts, counter-terrorism, and pharmaceutical regulatory cooperation; an e-government conference; and the re-establishment of the Fulbright student/cultural exchange program. The United States and Switzerland signed three new agreements in 2006 that will complement the JEC and will deepen our cooperation and improve our relationship. The first of the new agreements is the Enhanced Political Framework and was signed by Under Secretary of State for Political Affairs Nicholas Burns and Swiss State Secretary Michael Amb�hl. The second agreement is the Trade and Investment Cooperation Forum and was signed by then-U.S. Trade Representative Robert Portman and then-Economics and Trade Minister Joseph Deiss. The last agreement is the revised Operative Working Agreement on Law Enforcement Cooperation on Counterterrorism and was signed by U.S. Attorney General Alberto Gonzalez and Swiss Justice Minister Christoph Blocher. The U.S. Embassy in Switzerland is at Jubilaeumsstrasse 93, 3005 Bern, tel: (41) (31) 357-7011. The U.S. Mission to the European Office of the United Nations and other International Organizations is in Geneva at Route de Pregny 11, 1292 Chambesy, tel: (41) (22) 749-4111. The U.S. Mission to the WTO is in Geneva at Avenue de la Paix 1-3, 1202 Geneva, tel: (41) (22) 749-4111. The U.S. Delegation to the Conference on Disarmament (CD) is in Geneva at Route de Pregny 11, 1292 Chambesy, tel: (41) (22) 749-4407. America Centers and Consular Agencies are also maintained in Zurich and Geneva.